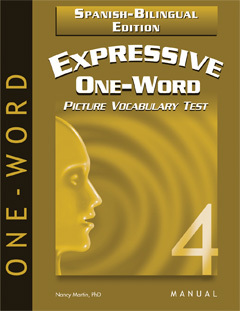 The Expressive One-Word Picture Vocabulary Test-4: Spanish-Bilingual Edition (EOWPVT4-SBE) can be administered in either Spanish or English or both languages, and the individual is given the opportunity to respond in either language. 180 color pictures are presented singly to the examinee, who is asked to name what is shown (picture, object, concept). As with the EOWPVT-4 (English version), the EOWPVT-4: SBE retains the use of prompts and cues (shown on the Record Form) to ensure that examinees will attend to relevant aspects of each illustration. Age-related starting points and ceilings (reached when the examinee makes a set number of consecutive errors) ensure that only a subset of items is administered, allowing testing to usually be completed in 20 to 25 minutes. Scoring is easy and straightforward, and generally takes about 5 minutes. Raw scores are reported as standard scores, percentile ranks, and (if necessary) age equivalents. Examiners must be fluent in both languages or be assisted by someone fluent in the language not spoken by the principal examiner, in order to understand whether any dialectical variants should be counted as correct. Raw scores are converted to standard scores, percentile ranks, and age equivalents. Words have been added both at the lower end for younger children and at the upper end for adults. The order of the 180 test plates is different from that used in the English editions, reflecting the developmental word usage patterns specific to this population, and simplifying both the administration and scoring of the test; all of the words were derived from the English-language 4th edition of this test. Each edition (English and Spanish) now uses its own set of test plates. IMPORTANT: Test components of the Expressive Spanish-Bilingual 4th Edition are not interchangeable with components of the Expressive English 4th Edition (2011). The stimulus picture plates differ in the two versions.